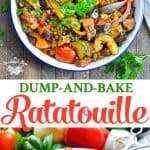 ​​​​​​​There’s no easier, healthier or tastier way to enjoy fresh summer vegetables than in this simple Dump-and-Bake Ratatouille! 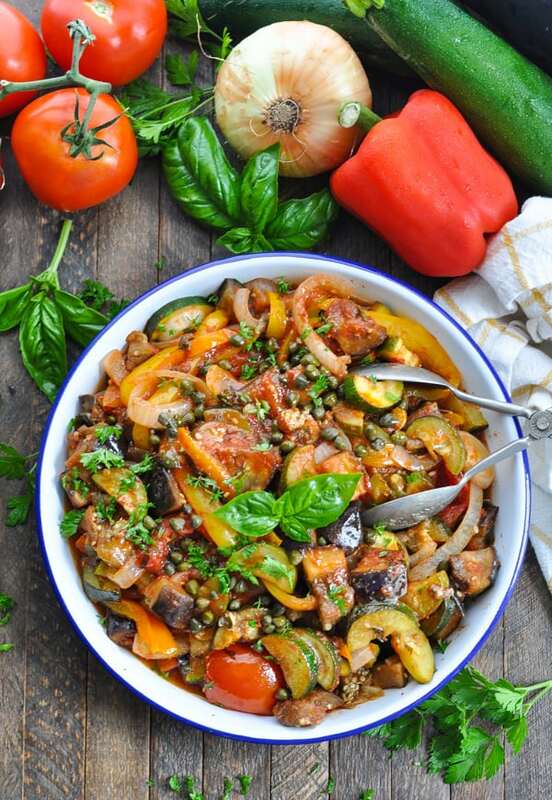 There’s no easier, healthier or tastier way to enjoy fresh summer vegetables than in this simple Dump-and-Bake Ratatouille! Served hot or cold, it’s a delicious side dish or vegetarian entree that completes any meal. 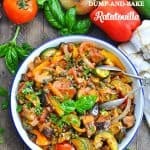 If you want to feed your family lighter, nourishing options that still taste good (and that your kids will actually eat), then this easy ratatouille recipe is the perfect solution! What ingredients are in Ratatouille? 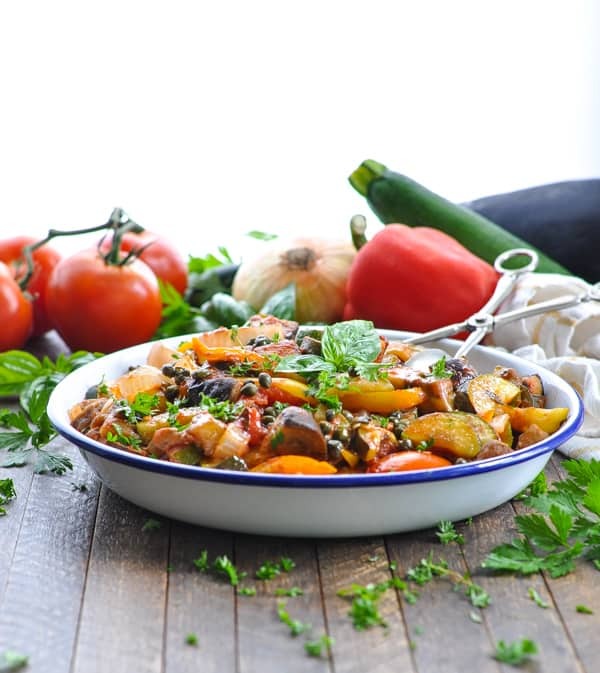 Ratatouille is a hearty, stewed vegetable dish from the Provence region of France. It traditionally consists of seasonal vegetables, garlic, and olive oil – often in a tomato sauce. Basic, right?! But there’s nothing basic about this flavor combination! They slowly cook together and create the most delicious, satisfying, and nutritious vegetable stew that you have ever tasted! As usual, I’ve kept my recipe very simple – without the fuss of fancy layers, spiral designs, or any other “formal” presentations that you might find in other similar dishes. 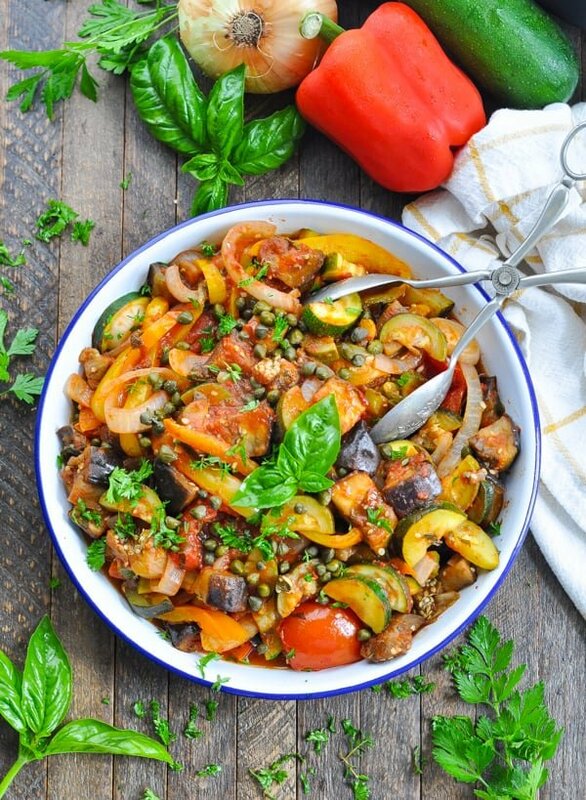 Using my dump-and-go method, this baked ratatouille is totally hands-off! Just stir everything raw in one big dish and let the oven do the work! This recipe is so flexible! You can serve the dish warm, at room temperature, or even chilled (leftovers straight from the refrigerator are SO GOOD). or even just a store-bought rotisserie chicken and some biscuits! 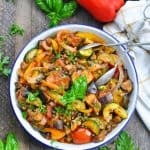 If you’ve tried this Ratatouille or any other recipe on The Seasoned Mom, then don’t forget to rate the recipe and leave me a comment below! You can follow me on Facebook, on Instagram, on Pinterest, and on Twitter! Cut the eggplant into chunks. In a colander, toss the eggplant with 1 tsp. salt, then let drain for about 30 minutes. Pat the eggplant dry with paper towels. Meanwhile, spray a deep 9 x 13-inch baking dish with cooking spray. Set aside. 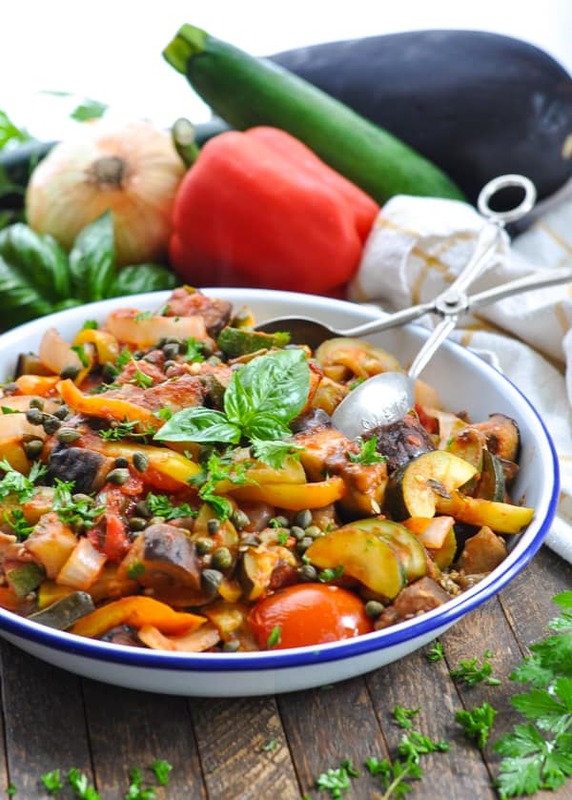 Preheat oven to 400 degrees F.
In a large bowl (or in the prepared dish), toss together eggplant, onion, bell peppers, zucchini, tomatoes, parsley, basil, oregano, tomato paste, olive oil, and garlic. 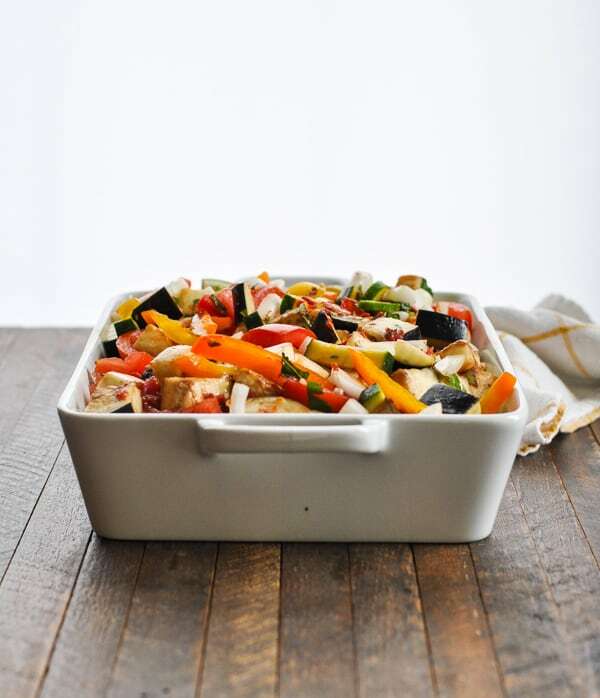 Transfer vegetables to the prepared dish, cover with foil, and bake for 45 minutes, stirring once or twice during the baking time to make sure that the vegetables cook evenly (or until vegetables are tender). Garnish with capers, drizzle with olive oil, and season with salt and pepper just before serving. Cooking Just for Two? 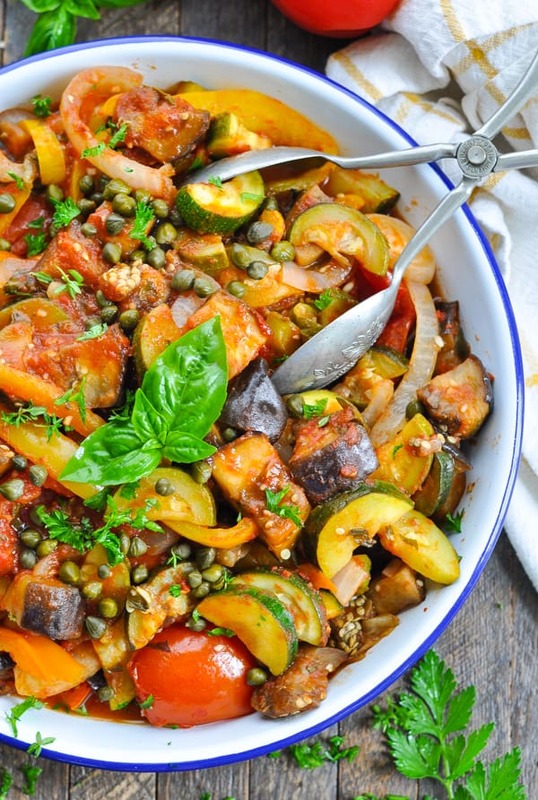 Cut the ingredients in half and bake the ratatouille in an 8- or 9-inch square dish. I’m so excited to try this one!!! You make great easy meals that are yummy! Thank you Blair! What a delicious veggie filled meal! And so easy too!!! This is fabulous, especially with farm fresh vegetables. I don’t usually comment on recipes but this is just wonderful. I’ve got my second batch in the oven rn. Have not made this yet but can this be made in slowcooker, for how long would you cook this ..
Every slow cooker runs on slightly different temperatures, so I always suggest that you keep an eye on it the first time that you’re cooking the recipe in your slow cooker. That said, I find that the recipe works perfectly when cooked on LOW for about 6 hours or on HIGH for about 3 hours.